We have decided, now that Jerry is retired, to "go south" for the winter each January and February. We have tried both Florida and Arizona. We are hoping to head for Texas next year. Daisy is enjoying the lake in Eureka, SD. From the middle of May until just after July 4th, we take our camper and head to Jerry's hometown of Eureka, SD. It is a small, little burg with under 1000 citizens. We spend two months on our lot beside the Eureka lake. I stitch and Jerry catches up with old classemates. A little over 10 years ago I learned a technique called back basting. 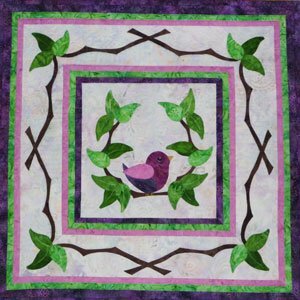 It was a fast and easy method of preparing applique patches for needle-turn applique. 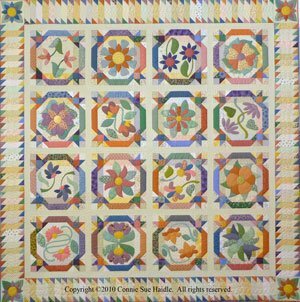 I began using it on my first quilt for Apple Blossom Quilts. That quilt is shown at the left. It is "My Christmas Baltimore". For back basting, your pattern is traced onto the wrong side of your background fabric. The applique fabric is placed on the front in the proper position and the design is basted on the traced line on the back. Then flipping to the front, we begin our applique. We snip the basting thread into short sections, remove a section and then using the holes left in the fabric as a guide we turn under our seam allowance and applique the patch in place. It didn't take me long to discover that not all fabrics will show holes after we pull our basting thread through it. Solution: I developed the necessary technique that doesn't rely on holes in the fabric. In another block I needed to add some embroidery to my design. How was I going to manage that? Solution: I developed a technique that would allow me to quickly and easily add embroidery where necessary. Several of the blocks in "My Christmas Baltimore" have berries. I'm not particularly fond of the traditional method of berry construction. It usually consists of starch and an iron. I find the berries I make with this technique are way too stiff and if I accidently touch them with an iron they can become rather shiny. Solution: You guessed it. I developed my own technique. 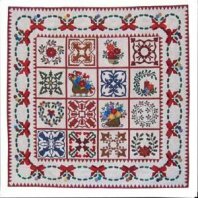 It produces nice round berries that are easy to applique and will not be stiff and shiny. Well, I could go on but I think you get the idea. I loved the idea of back basting but didn't want to deal with its drawbacks. Each time I had a problem I thought about it, experimented and eventually developed a solution for that problem. This collection of solutions has become my Quick Prep Applique Method. Join me in one of my workshops to learn about these techniques. Swingin' in the Twees Before coming to class you will need to learn the Appliquer's Knot. This knot rests at the base of our needle and will prevent the thread from pulling through. If you have ever worked with silk thread you will know that it can be a real headache. This knot is the perfect solution. Actually it can be used in a lot of situations. Just be sure that the base of the needle is about the same size or bigger that the knot and you can use it with any thread. Click here to learn how.